ITH Embroidery Machine Patterns are also PDF Sewing Patterns! ♥ These are the Sewing Pattern Equivalents!!! ♥ Same Pattern Designs just shown in different fabric! ♥ I will be adding more very very soon! Master Tippy Toes ITH Machine Embroidery Pattern is here at last! Easter Egg Hunt Pattern SALE is here! 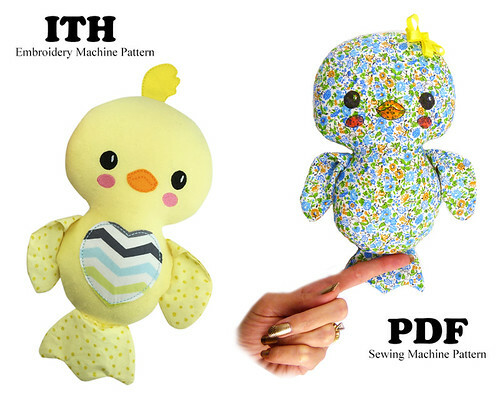 NEW cute Chick Easter Egg Sewing and ITH Patterns are here! NEW Tiny Tot BunBun and their Tiny Tot Carrot Totes Patterns are Out Now! !